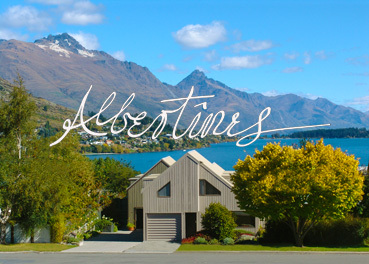 The combination of an excellent address, breathtaking views and seriously charming spaces make ALBERTINES HOLIDAY HOME the perfect place for holiday-makers looking for stylish, self-contained accommodation. 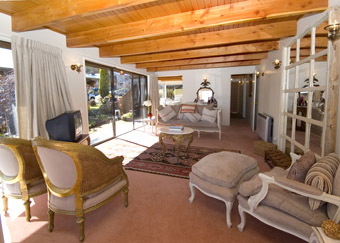 Fully equipped for couples, groups of friends, relocating or holidaying families. Fully furnished by the Designer-owner with European Vintage furniture, antique chandeliers, Louis XV armchairs, and comfy Ottomans combined with contemporary NZ art. Upstairs, the large Chandelier bedroom with Queen Vintage gilt bed and mirrors attract rave comments from our guests. There's a fully equipped kitchen - and the very spacious open-plan dining/living room opens onto a charming courtyard garden, awash with roses and buxus hedging. 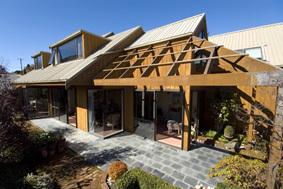 Overlooking the sparkling waters of Lake Wakatipu's Frankton Arm, in a Sunny quiet neighbourhood, ALBERTINES HOLIDAY HOME is only a five minutes drive to Queenstown centre and most of the action spots - vineyards, 3 ski resorts, 6 golf-courses and 1.5 ks to Frankton's new shopping destination, Remarkables Park.